Wear layer: The top wear layer of laminate is typically made of aluminum oxide while the pattern of the flooring is a photograph applied to a melamine laminate base. The aluminum oxide wear layer provides incredible strength against most scratches. The melamine keeps the floor from staining and discoloring from direct sunlight. Center core: The center core should always be made of a smooth high-density fiberboard. The core adds impact resistance and forms the tongue and groove locking system. Some manufacturers, to improve moisture resistance of the core, also impregnate melamine plastic resins in the core. Melamine is a plastic-like resin used throughout the construction process to add durability, and stability to laminated planks and tiles. Backings: The backing board varies depending on the manufacturer’s discretion- but it ranges from a paper layer to a full plastic laminate layer. The backing is constructed of a heavy layer of melamine foil. The backing is primarily used as a balancing agent to stabilize the board in order to stop cupping and bowing. In addition, it also has water resistance qualities. Dimensional stability is much greater with a solid laminate backing than it could ever be with just paper. 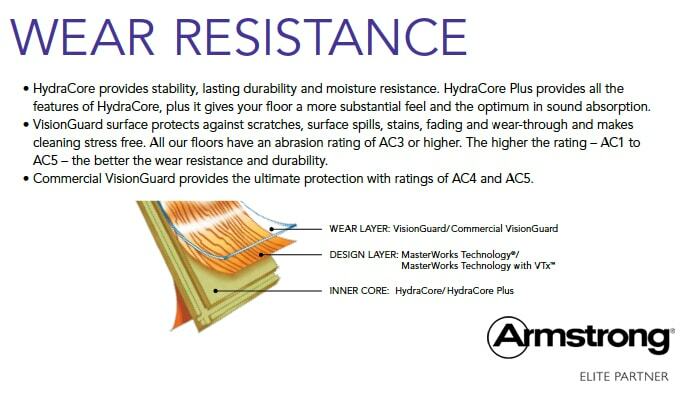 Those with laminate backing provide better protection against potential water damage than those with paper backings.